The Affordable Care Act’s health insurance marketplaces have made sexual and reproductive health care accessible for millions of people by making comprehensive coverage affordable and helping to ensure enrollees can use that coverage at nearby providers. Upending these marketplaces and their protections for enrollees’ coverage and provider access would have serious consequences, particularly for lower income women of reproductive age. President Trump, his administration and many conservatives in Congress remain intent on repealing the Affordable Care Act (ACA), despite widespread pushback and concerns over the potential loss and diminishing quality of coverage, increased cost to individuals, and ultimately, the harm to people’s health and well-being. Their effort encompasses not only rolling back states’ Medicaid expansions and fundamentally altering Medicaid itself (see “Why Protecting Medicaid Means Protecting Sexual and Reproductive Health,” 2017), but also changing the way that individuals can buy private coverage and, essentially, dismantling the ACA’s health insurance marketplaces. Conservatives are seeking to overhaul or eliminate the ACA’s subsidies for marketplace coverage, eschew requirements that private plans cover a standard set of basic health care services and weaken requirements of plans to ensure accessible provider networks that marketplace enrollees can rely on. If they succeed in upending the affordability and usability of private coverage in these ways, there will be serious consequences for individuals’ access to basic health care, which includes sexual and reproductive health care. Subsidized private plans have helped more people get coverage. Online marketplaces have given people the chance to better understand how health insurance works and explore plan options available to them. In addition, the ACA’s marketplaces have helped millions afford health coverage. 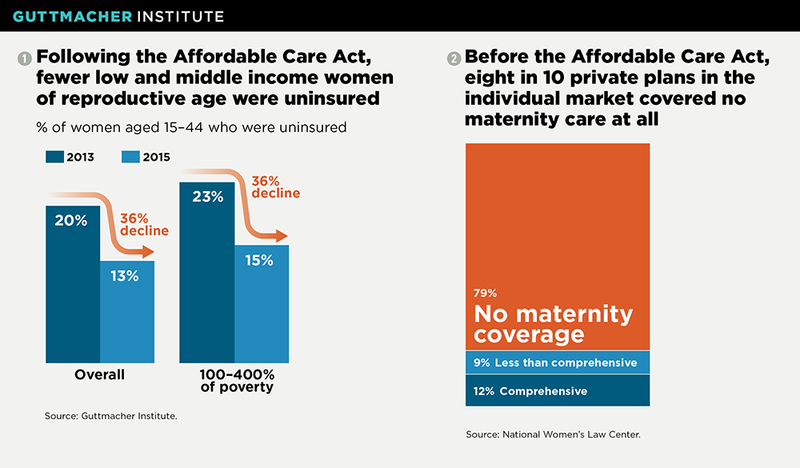 In particular, considerably fewer U.S. women of reproductive age lacked coverage following the first two years of ACA implementation.1 Nationwide, between 2013 and 2015, the proportion of women aged 15–44 who were uninsured fell by 36% (see chart 1). This decline was driven by substantial gains in both Medicaid and private insurance coverage. The ACA allows states to expand Medicaid eligibility to individuals with incomes up to 138% of the federal poverty level; thus far, 31 states and the District of Columbia have taken up that option.2 (The federal poverty level is $20,420 for a family of three.3) For individuals with incomes too high to qualify for Medicaid, the ACA provides financial help to purchase private coverage through an online health insurance marketplace: People with incomes between 100% and 400% of the federal poverty level can get refundable tax credits to lower the cost of their monthly premiums, and those with the lowest incomes (100−250% of poverty) can get additional subsidies to reduce their out-of-pocket costs when obtaining health services. About six in 10 people who are enrolled in marketplace coverage receive cost-sharing subsidies, and eight in 10 receive premium tax credits.4 And under the ACA, the amount of these tax credits is tied to the cost of coverage and to enrollees’ incomes, so lower income individuals in states with higher cost plans benefit most. Marketplace plans must cover core sexual and reproductive health services. In addition to making private coverage more attainable, the ACA has made private coverage more comprehensive. Notably, all marketplace plans (like other plans sold to individuals and small employers outside the marketplaces) must cover a set of 10 “essential health benefits.” Among these benefits is maternity and newborn care, which in practice means a whole suite of services, including prenatal care visits, screenings and services that promote maternal and infant health, and labor and delivery. Marketplace plans (like most other private health plans) must also cover dozens of preventive care services without patient cost-sharing, including a slate of services central to women’s sexual and reproductive health. In addition to at least one well-woman preventive care visit each year, these services include 18 methods of contraception and related services, Pap tests, testing and vaccinations for human papillomavirus, counseling and screenings to prevent HIV and other STIs, screening for intimate partner violence, counseling and education on breastfeeding, and breast pumps (see “Beyond Contraception: The Overlooked Reproductive Health Benefits of Health Reform’s Preventive Services Requirement,” Fall 2012). Marketplace protections help ensure an accessible network of reproductive health providers. To translate coverage into affordable care, enrollees must be able to access a nearby provider who accepts their insurance. To that end, marketplace plans must adhere to certain “network adequacy” standards—that is, measures to ensure plans maintain provider networks capable of delivering timely, quality care to all enrollees. Broad federal standards established under the ACA apply to all marketplace plans; however, as is the case with health insurance regulations generally, state policymakers have a great deal of flexibility to establish and enforce more specific requirements of plans’ provider networks. Frequently, state standards require marketplace plans to include a sufficient number and geographic distribution of private practitioners, such as obstetrician-gynecologists and nurse-midwives, who provide reproductive health services. The ACA further requires all marketplace plans to contract with so-called essential community providers. These are providers that primarily serve low income, medically underserved individuals who are likely to experience difficulty accessing care—in large part, the very demographic targeted by the ACA’s coverage expansions.7 In states that opted for the federal government to administer their ACA marketplaces, plans are held to standards for contracting with essential community providers set by the Department of Health and Human Services: Currently, a plan offered through these marketplaces must contract with at least 30% of the available essential community providers in its service area and offer contracts to at least one safety-net family planning provider in each of the counties that make up the plan’s service area (where available).8 Many states that chose to administer their own ACA marketplaces have adopted these same federally defined standards, and some have even stronger contracting requirements (see “Marketplace Plans’ Provider Networks Are Just Not Adequate Without Family Planning Centers,” Spring 2015). The ACA’s coverage advances are being felt within the family planning safety net. A recent analysis of data from 28 safety-net family planning providers across the country found that the overall proportion of uninsured client visits decreased from 44% in the last three quarters of 2013 to 33% during the same period in 2015.9 This drop was the result of increases in both visits paid for by Medicaid and those paid for by private insurance. Dismantling marketplace coverage would harm sexual and reproductive health. Continuing a years-long crusade, conservative policymakers in Congress have been working to dismantle the ACA, including some of its key provisions that advance the accessibility and quality of coverage available on the health insurance marketplaces and in private insurance more broadly. In addition, the newly installed secretary of the Department of Health and Human Services, Tom Price, has long vociferously opposed the ACA and its contraceptive coverage guarantee specifically. His agency can undermine or eliminate that guarantee, with or without congressional action. Although private plans widely covered contraception prior to the ACA, many failed to cover all methods, and most required copayments that put certain methods—and potentially any method—out of reach for many women (see “What Is at Stake with the Federal Contraceptive Coverage Guarantee?,” 2017). Moreover, the Trump administration is already moving to weaken provider network requirements, by proposing that the proportion of essential community providers with which plans on the federal marketplace are required to contract be reduced from its current minimum of 30% to 20%.16 That is the opposite direction such standards should be going to ensure that lower income enrollees in particular are able to access the family planning and related care they need. At the beginning of his term, President Trump issued a decree that his administration do as little as possible to support the systems and standards required to facilitate the ACA and its marketplaces. With the failure of the House leadership’s bill in March, Trump asserted that the ACA’s marketplaces would “explode” on their own—a signal to many observers that his administration might actively sabotage the law from within. Taken together, all of these actions make it clear that the Trump administration and Congress are poised to take affordable, comprehensive private health coverage—including coverage of much-needed sexual and reproductive health services—away from millions. If they succeed, it would be much to the detriment of the health and well-being of individuals, families and the nation’s public health. 1. Frohwirth LF, Guttmacher Institute, Special analysis of data from the 2015 American Community Survey. 3. Office of the Assistant Secretary for Planning and Evaluation, U.S. Department of Health and Human Services, Poverty guidelines, 2017, https://aspe.hhs.gov/poverty-guidelines. 12. Congressional Budget Office, Cost Estimate: American Health Care Act, 2017, https://www.cbo.gov/publication/52486. 16. Patient Protection and Affordable Care Act; Market Stabilization, Federal Register, 2017, 82(32):10980–10998, https://www.gpo.gov/fdsys/pkg/FR-2017-02-17/pdf/2017-03027.pdf.